The announcement of a new animated version of The Power of the Daleks to be sold on BBC Store was more of a curiosity to me than something to get excited about. While I think the previous examples of animation are a perfectly acceptable way to watch the odd episode in an otherwise all-original-footage story, I didn't find the prospect of a totally animated story of especial interest. It's not that I'm more in favour of photo recons for the missing episodes -- what they gain from having original pictures they lose in terms of movement and energy, I find. Obviously I'd much rather the episodes themselves were found and returned so we can see them in all their glory (or modesty, as the case may be), but in the meantime I'm happy listening to the narrated soundtracks and letting my imagination do the rest. As a download, then, I wasn't that enthused by an animated Power. Then a DVD release was announced, along with a good set of extras including a telesnap reconstruction, which I felt that was a fair way of serving fans of either reconstruction style. Even then I wasn't in a rush to get the DVD, and it hadn't even occurred to me that I might produce an alternative cover, its being over a year since I last updated Velvet Jacket and I considered the site done while I concentrated on producing more Wonderful Books. It was only with the publicity around Power's release on its 50th anniversary and some great photos being unearthed (particularly those from Radio Times) that cover ideas began to float around the back of my mind and I figured I should have a crack at it. I quickly hit upon the idea of a series of Daleks in increasingly powered-up states, from dormant and shrouded in cobwebs to full-on exterminating rampage. One of the best Dalek shots from the story is that used on the cover of the contemporary Radio Times, which I felt would fit in the unusual space of my cover layout rather well, even if it is an often-used image in others' illustrations. It fitted best on the right of the composition but I didn't want it facing into the cover -- it just felt better to be facing outward and firing its weapon out of the frame. This meant flipping the Dalek, which as any self-respecting fan knows is generally a no-no as the arms are then the wrong way round. This is something I've done before, such as on Resurrection of the Daleks, and just involves swapping the arms back the right way -- although this can be tricky depending on their original position and what other parts of the Dalek's body they (particularly the sucker) are covering. Here the gun is also flipped to be pointing up rather than down for a more dramatic firing angle, while the sucker arm is actually replaced with one from another image as it was at a better angle for its new positioning. That wasn't the end of the Dalek-flipping problems, however. I wanted the rear one facing to the left but, of course, all the suitable side-on photos I could find were of Daleks facing right. So more flipping and arm-swapping was required. (I did afterwards find a shot of the two dormant Daleks in the capsule already covered in cobwebs that I could have used but where would the fun be in that?). Even the middle Dalek didn't get away without modification; not only did I remove its gun but I also swapped its dome for another's so that it was looking menacingly out at the viewer. 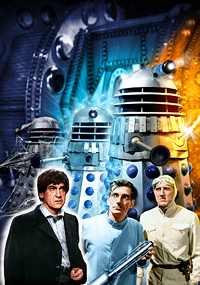 All three Daleks were, of course, black-and-white photos so I colourised them in their correct colours before then overlaying coloured lighting effects. The foreground figures also required colourising and further manipulation. In the original shot of Lesterson and Bragen, the former is holding the laser device used to open the capsule door (which I only learned from watching the animation! Never knew that's what it was before). I thought it would be nice to replace this with a Dalek gun, tying in with the unarmed Dalek behind. Straightforward to do, but cutting out the rods on those guns is a pain in the neck! For the Doctor I was going to use another of Don Smith's wonderful Radio Times shots of him, Polly and Ben venturing into the capsule. The expression on Troughton's face was perfect but the image, although large and hi-res, was quite grainy and lacking in detail. So in the end I kept the head but transplanted it onto a different body shot (thankfully in colour, saving me some work). His hair was in shadow and so largely just black, so I patched in detail from another photo.